Memories can do wonderful things. They make you cry when you least expect, and they can make you smile no matter how much sadness grips you. We are what our memories make us. The person that you see everyday at the mirror is living and breathing because of these memories. In these mad times, we often forget who we are, where we belong and where we are destined to go from here. Trust me, whenever you feel devastated, just sit back, or go out and take your memories along with you. You will instantly know what you are supposed to do. There is a time in our lives when we find that one person whom we think as everything. And when they leave, it is the memories that stay along with us. A moment spent with our loved ones may take decades to forget. I have the honor of spending some of my life's best moments with people who made me what I am today. It was raining today and I wanted to enjoy in my own way. After work today, before I got back home, I simply switched off my cell and went for a walk along the lake. The place frequented by joggers and lovers, was all desolated at that point of time. The silence of the night was only broken with bikes with rushed by. It was only me, my thoughts, a warm cup of tea and some drops of cold November rain. I just let go the thoughts which came rushing to me with every drop of rain falling on me. In the cold November rain.."
I remembered back then, I never had to experience the rains alone. I had someone besides me. 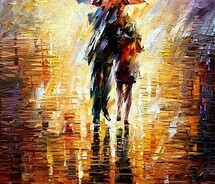 The person made me love the rain. We spent the days and nights laughing and dancing all throughout the rains. And now..only the memories remain. I remembered them all. The time spent without any worries about the future, the time spent being at that particular moment, the time spent, perhaps, being pure happy. Our loved ones are there because god wants us to enjoy the moment. And to see us smile all throughout our lives, he has created memories. Sometimes, being alone with nothing else than a cup of tea and some memories is more than enough to restore the smile back on our faces. I heaved a sigh of relief. I had finally over-powered my past demons. I was successful at suppressing the bad memories and was happy and contended with what I had right then...myself. Cherish your loved ones, and the memories they leave you with. These memories will be the lighthouse during stormy nights and will guide you to the morning where happiness lies and love rules. ..oh,it has been almost 6 years na..
Time seems to fly so fast in these mad,hectic times..but yes memories do live by.. Amazing!! Its said that we meet to make memories and part to preserve them. I have read almost all your blogs but this one is my most favorite up til now.. You know, memories can heal you and can even give you an invisible wound!! They are never seen, magical nevertheless! !